Your music has never sounded this good. 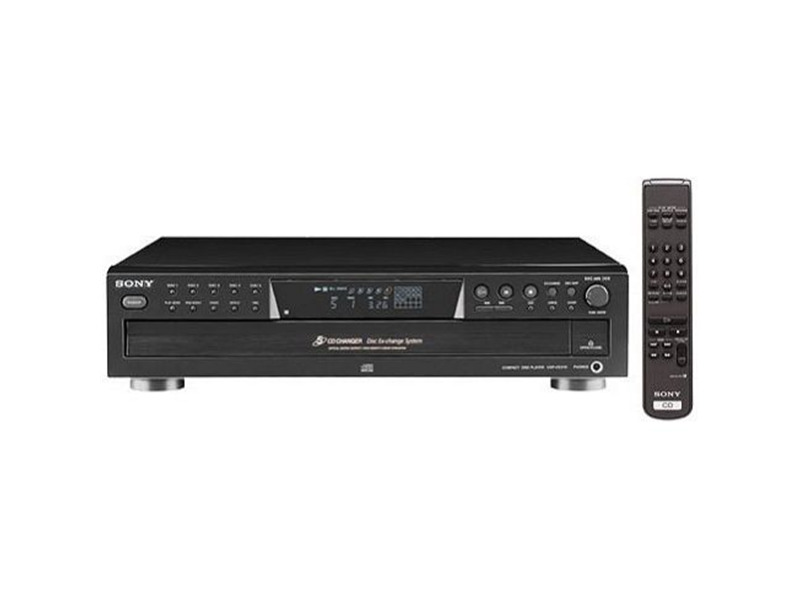 Play your tunes on Sony's CDP-CE375 Compact Disc Player for a superb sound experience. This 5-Disc changer features CD-R/RW playback capability so you can enjoy your homemade music mixes as well as the latest industry releases. Additional features include a Headphone Jack and volume control, 20-Track Music Calendar, and 32-Step programming. Use Jog Dial control with Direct Access track selection to control your listening experience and get ready to rock. Play 1/Exchange 4 Capability, Jog Dial Direct Track Access, Optical Digital Output, Remote Control. I realize other people have had service problems with this model but I can only give a review based on my experience. When I sold audio gear years ago I was surprised by how much better Sony CD players tended to sound when compared to other, similarly-priced brands (though I was never a fan of Sony receivers). I picked up this CD player (manufactured in 2007) for $6 in a local Goodwill and it surprised me by sounding noticeably better (for CD playback) than my newer, Sony Blu-ray player as well as an LG Blu-ray player. It also clearly outshines an old, Yamaha CD player I have. I use the analog outputs on this unit with high-quality cables. I know this uses the old DAC in the player but it seems to work well for playing CDs. I use this CD player in a secondary system with a Denon receiver and some older, Boston Acoustics speakers (VR-940 -- also purchased used) that I was not quite pleased with until I added this CD player to the system. Sounds pretty good now. These players have a reputation for developing service problems over time but mine has no such problems even though it is 10 years old. The voicing of vocals is rivetting and the base is convincing without getting in the way. The top end is so smooth and clear that my Sound Dynamic speakers seem to place snare drums and viberphones into the middle of the room. As far as the function of the remote I can only say that it is capable of multiple random play or singeling out any track on any disc. It's easy to understand right out of the box and so far the CDP-CE375 has responded to all remote commands without any hang-ups. I'm hard pressed to find any fault with player, especialy at this price point. My Speakers are reputed to reach down to 37 Hz (agreat feat for a 6" polypropylene woofer)and I noticed that the very deep notes on Dave Hollands double base are missing the vibrato that you would expect from a player designed for the audiophile market. However a player that would "have it all" would likely cost over $1200.00. When my NAD cd 520 cd player (list price $299 paid $250) refused to play my CD-Rs I decided to look for an inexpensive player that would. I first purchased a Harmon Kardon carousel w/HDCD capability. After a one night home test I discovered my new purchase did not play some of my CD-Rs. I rememberd hearing a great sounding CDP-CE375 as I walked past the less expensive equipment and stopped to inquire about this great sounding redicoulously cheep player. After I returned the Harmon Kardon I decided to purchase the CDP-CE375. When I got it home and played some of my favorite CDs & CD-Rs I was blown away. This player (list $129 purchased $119) blew the doors off my NAD for musicality, high frequency detail without sounding edgy,and base response that was deep and respectable without being boomy. I could not help feeling I needed to upgrade my speakers. I purchased a pair of Sound Dynamics RTS-3s from an audiophile mail order company that were seling them on clearence (since Sound Dynamics was solt to Athena Technologies)for the redicolous low price of $150 for the pair. In short I now have a system that has put on the back burner the purchase of a Passive preamp to complement a vintage Fisher 300B tube amp that I recently re-tubed. What am I using for an amp currently? I'm playing my new CDP-CE375 through an AR integeated amplifier (solid state, 60 wpc.) CIR. 1973. I don't know what thwe wizards at Sony are running in this extreemly modestly priced CD player but all I can say is thank you for saving me a lot of money. P.S. I'm using 24 guage magnetic wire for inter connecects and a double run of 18 guage solid core hook-up wire for my speakers. A nice cd player for only $120 Just to see I compared it to another base Sony cd player from 1990, a single-disc CDP-39. 10 years sure makes a difference! The specs are proof. The new one sounds noticably better. I also compared it to my 1991 Sony CDP-X555ES single-disc. The CDP-CE375 is good, but doesn't compare, not even close, but that is why the ES had a list price of $1000 The build quality of the 5 changer is just okay, all the parts fit togther well but it just isn't real solid when viewed against the ES. The tray makes a whole lot of noise opening and closing. The sound is also a little too bright, something that all cd players suffer from. But it isn't real bad and has very good detail, well recorded strings and female vocals sound very good. I don't see the advantage of the dial to advance tracks instead of butttons, but it doesn't hurt. Layout is convenient, and it looks good to boot. Overall very pleased.